PRIVATE TOUR: The Tour is Only for You And Your Family. DISCOVER: See Secret Places That You Could Not Find Alone. CHILDREN WELCOME: Capture The Imaginations of Young Travelers. DRIVING TOUR ONLY: Driver Is Not A Trained Guide and Will Not Narrate The Tour. YOUR OWN PACE: Tour Pace is What You Want it To Be. Stop For Photos Whenever You Want. CHAUFFEUR will pick you up at your apartment at the scheduled time in a Private Car. No other groups or persons will be in the vehicle with you. Driver Will Take You to See Many Paris Sites and Allow You Time To Take Photos. After 2 Hours Driver Will Return You to Your Apartment or Other Place of Your Choice in Central Paris. AND AS MORE MUCH AS TIME PERMITS! 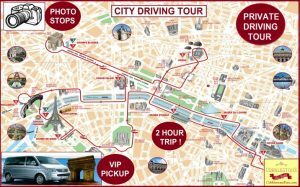 Your driver you will take you on an exciting drive through central Paris. Both the LEFT BANK and RIGHT BANK will be covered. You Can Ask Driver To Stop Whenever You Like to Get Out and Take Photos. You will pass through major Paris attractions as well as hidden corners usually missed by visitors. START TIME: Anytime between 12 pm and 3 pm. TOUR LENGTH: Approximately 2 hrs. STARTS: At Your Apartment or other Central Paris Location That Is Convenient. ENDS: At Your Apartment or other Central Paris Location That Is Convenient. PRICE: 99 Eur for 1-4 Guests. INFORMATION PROVIDED: This is Not a Narrated Tour.